The Short Version: The inherent machismo of the CREATURE trilogy reaches its zenith in this last of the series, the most character driven of the three; and a radical departure from the two previous movies in a few ways; one of which is the abandonment of 3D. Shockingly, the relationship between the monster and the girl is downplayed for a disturbed husband, horny hunter, and a respectable geneticist looking to better mankind angle. The title has a double meaning in that the 'Creature', or monster, is also man, and that inner primal savage walks among us as well. Meanwhile, the Gill Man becomes the Gill-less Man -- castrated by his human counterparts, longing for his watery true love, but never to enjoy it again. It's a compelling, if melancholy trilogy closer, but alas, it's unfortunate that 'Son of the Creature' never materialized. Another group of scientists set sail aboard a yacht with a fully functioning laboratory to study the Gill Man after he's been sighted in the Florida Everglades. After a harrowing encounter, the Creature is badly burned and rendered unconscious. The scientists -- some of whom have different motives -- take him to a research facility in California where they perform an operation to save his life. The operation is a success, but now with his gills removed, a noticeable change has occurred that has made the monster more human. The CREATURE trilogy closes out on a high note with this engaging, non-3D sequel that matches the first movie in a variety of ways. Moreover it leaves the increased action quotient of the second picture, REVENGE OF THE CREATURE (1955) behind while striving for loftier, expositional ambitions. The storyline is the main focal point, so those expecting familiar Black Lagoon theatrics have something entirely different in store for them. Firstly, it takes approximately 30 minutes for the first interaction between man and monster to occur. We see the Gill Man prior to that, but these shots are left over from the first film. An underwater sequence where Dr. Morgan, Marcia, and Jed search for the Creature has stock shots inserted as well. The first actual encounter -- at night in a small boat -- is among the best sequences of the picture. A noticeable amount of suspense is derived despite the familiar trappings, and that we all know what the monster looks like by this point. Aside from a few exciting set pieces, the most intriguing attribute of WALKS AMONG US is in its characters and concepts. Returning from CREATURE FROM THE BLACK LAGOON (1954) is contributing writer Arthur Ross. He gets sole credit here, and he goes hog wild with characterization -- creating the sort of character arcs you rarely, if ever got in these sorts of science fiction-horror movies, particularly of the B level. As much as the Creature evolves, so does the storytelling. The ugliness of man is put on display for onlookers, while the ferocity of the Black Lagoon's most famous resident is substantially reduced. It's a daring, if ingenious concept that will be appreciated by those willing to accept a sequel going in a totally different direction from what came before it. While the Creature does Walk Among Us, that "Creature" isn't just a half man, half fish left over from the Devonian Era -- it's the ugliness of man that walks among us within ourselves. That bridge between man's inner primitive and his civilized nature stretches across a fairly vivid quartet of four characters with the Gill Man, or the now Gill-less Man, caught in the middle. This love triangle was seen in the two previous pictures, but nothing quite like what is presented here. A lot of hate has been added, too. The two leads in WALKS AMONG US are much stronger than the second movie, and Ross's script gives them lots to chew on. The Carlson and Denning arc was a tense rivalry, but both men respected the other; the Agar and Bromfield arc was of a friendlier nature, what little of it was espoused in the second film. The Reason and Morrow match-up of Sherwood's movie is the most complex of the three films. It starts off very professional, then slowly dissolves from there. The two men never come to blows, but both eventually nurture an uneasiness between them. Morgan knows Barton is slipping into madness, and Barton becomes suspicious of Morgan whenever he enters into conversation with his wife. If that weren't enough, a third male suitor is added to this potentially volatile mix in the form of jungle guide Jed Grant, an all around sleazeball, and the man who takes our intrepid scientists to where the Gill Man is located. With three men centered in some way around Marcia (Leigh Snowden), that leaves us with the Creature. Ironically enough, the 'Beauty and the Beast' angle that was integral to the first two films is almost non-existent in this last entry. Even more surprising is that the monster is, at least once he's humanized, turned benign -- the savage beast is soothed -- for a time, anyways. He even walks into his observational area without the aid of chains or shackles. There are a couple of spots where the monster spies Marcia, but never takes it to the next step of claiming her as a mate. He even saves her from being raped at one point, but never attempts to make off with her; even more surprising is that not once in the entire movie does the Creature even carry her off! After he's badly burned from top to bottom during that harrowing capture sequence, the scientists discover a second skin beyond his severely charred gills, as well as a set of lungs allowing a minor amount of air to keep him just barely alive. After performing a tracheotomy, the metamorphosis of the now Gill-less Man continues. It continues to the point where the monster is no longer a monster, but an increasingly docile shell of its former self that, scarcely resembles its fishy origins; and now looks like Lou Ferrigno in a monster suit. This transformation is another startling aspect of this film. Both the fire and the surgical procedures have turned the formerly aggressive Creature into a passive beast capable of displaying emotions -- they've essentially castrated him. The loss of his gills is equatable to the loss of his manhood. Which brings us back to his disinterest in Marcia Barton. His one true love is the water, and he can never have that love again. Morgan: "If [the Creature] thinks all men are his enemy, if he can't see things the way they are instead of the way he thinks they are, he lives in terrible fear." Barton: "He's only an animal." Morgan: "The same holds true for man. If man, or animal becomes too terrified to think, he resorts to violence. And in the animal world it's called the law of the jungle. But when it happens to human beings, its name is murder." By this point, there's been a total role reversal between the Creature and mankind that has hunted him for so long. The monster does resort to violence, but it's out of self defense whereas Barton is prone to aggressive, even murderous tendencies because his pride has been damaged. Of all of Jeff Morrow's (at right in insert) genre performances, this is arguably his best, most complicated character he essayed in science fiction films. He co-starred with Rex Reason the previous year in the big budget classic THIS ISLAND EARTH (1955), the innovative B/W SciFi alien invasion film KRONOS (1957), and the literal turkey from outer space that is a classic of another kind, THE GIANT CLAW (1957). He returned to the genre in 1971 with Harry Essex's mediocre monster movie, the BLACK LAGOON remake, OCTAMAN. Leigh Snowden's character is the female center by which all the men revolve; and she's an unusually strong female persona for one of these movies, at least temporarily. She's musically inclined (she plays piano and guitar), she's fearless, been on numerous hunting safaris, and is proficient with guns. At the same time, she tries to remain a dutiful wife to her mentally unstable husband who thinks she's having an affair with every man but him. The script abandons this strong feminine mentality almost as quickly as it's introduced. Marcia is gradually reduced to "woman in distress" status. For a brief moment, though, Marcia is one of the guys. Actor Don Megowan played the land-dwelling Creature, and Ricou Browning briefly returned for the underwater sequence wherein the monster, post operation, attempts to return to the sea, only to discover he can no longer breath underwater. Megowan does a fine job as the lumbering "Frankenstein's Creature". At approximately 79 minutes in length, he's not given enough time to emote to a large degree, but there are a few moments where Megowan's monster gets the sorrow across succinctly. His rampage at the finale is extensive and spectacular wherein he thoroughly remodels the maniacal Dr. Barton's mansion while unleashing his man-fish fury. The music is (mostly) new compositions, with only a few spots dotted with that classic Creature cue that dominated so much of the previous movies. Reportedly, Henry Mancini (THE PINK PANTHER) was responsible for a sizable chunk of the score! 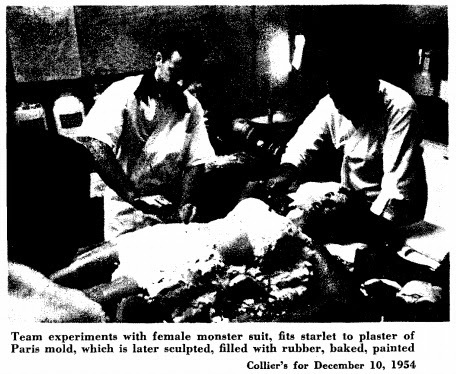 THE CREATURE WALKS AMONG US (1956) isn't your typical 'Part Three' of the average movie series. It takes a huge chance by refusing to play it safe, going all out in a totally new direction. Performances are strong, the script is good, and a greater deal of pathos is accrued for our title monster leading up to a surprisingly downbeat finish -- closing with a coda that echoes man's failure to cage the wild beast within us all. It could be better, but for what's here, it's surprisingly well mounted with a few great sequences and the usual scientific gobbledygook found in B cinema. Some will be undeniably disappointed with this series closer, but others may be surprised at just how creative this one gets as opposed to trotting out the same old Creature.